This project was recently funded by the Australian Research Council (Future Fellowship). It will commence in mid 2017. In this period of mass species extinction, this multi-sited project explores the cultural, political, and ethical dimensions of biodiversity loss in the Pacific region. Grounded in “field philosophical” work, the project brings ethnographic research into dialogue with philosophy, cultural studies, and the natural sciences to explore people’s consequential entanglements with threatened species and places. How does extinction shape the contours of local lives and landscapes? How does it impact on livelihoods, cultural practices, modes of understanding and meaning-making? How are contemporary and historical patterns of extinction caught up with other, often ongoing, forms of violence and dispossession? What does it mean to inhabit these landscapes of loss – perhaps as sites of possibility and transformation? 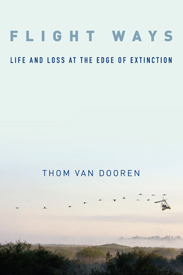 At the heart of this project is an interest in story(telling), in the diverse ways in which people make sense of extinction, its consequences and entanglements. Alongside conventional academic writing this project aims to cultivate broader social dialogue on extinction in its diverse and always unequal cultural forms through public-facing writing, documentaries, and a digital exhibition. In addition, the project seeks to contribute to local people’s capacities to tell their own stories on their own terms through the creation of a multimedia living-archive of extinction stories from around the region. More information will follow as the project takes shape. Please get in touch with any questions or ideas.